Hate to me nitpicky, but the song they sing here is "Summer Days" from Sound Magazine" not "I'm on my way back Home"
Starting early today as I was home for lunch today. Interesting about this episode is that this is one of the first times since the beginning of the show where the subject of Shirley being a widow comes up as significant. Keith really tries but a blanket statement by a teacher is difficult to interpret and really was a bit misplaced. The fact that Keith was walking to school with Danny already showed some family caring and Keith always helps with the driving of the bus on tour. My husband always mentions how good his big brother was to him and his younger sibling as far as taking them out and spending time with them so even at the end when Keith is taking the kids to the circus that's a good thing and he learned balance. Of course, I know the point is to have humor so Keith's efforts were fun and the touch of him having a tie on when Danny comes to talk to him is amusing. Anybody notice that the picture Danny pulls down of Keith in the garage is the one used on te Book Cover that was inserted in Up to Date? I like this episode. I thought the kid were a bit cruel as Shirley & Keith walked in from shopping, but I suppose if they weren't, the ending, when Keith's feelings are crushed wouldn't have been so powerful. You really felt for him. I enjoy picking out areas on the Ranch where they filmed. 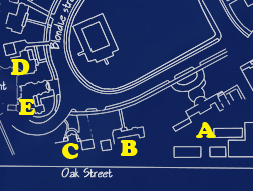 If you are facing it, the school building (A) (also known as the Civic Building) is to the left of the "Hazel" facade (B), which in turn is next door to the "Bewitched" facade (C) and around the corner from the PF's house (D). It's no longer there. As Keith and Danny are giving each other jabs as they walk to school, (prior to the coach talking to Keith), you can the the PF's neighbor's house (E) in the b/g. It shows just how close all these areas were, even though they don't appear to be in the same vicinity. I LOVE THE RANCH STUFF!!! "Summer Days" really fits this episode as presented. It's a fitting closure when Keith sings to each of his family members. It's especially sweet when he kneels in front of Tracy. One of my faves from Season two..... for the scene of Keith and Shirley walking in and over hearing what the kids are saying.... still chokes me up today. Sweet, funny and touching. One of my personal favorites from the second season. And "Summer Days" is definitely one of the BEST songs from "Sound Magazine". Love this episode. Everyone gets something to do. And I do like that the issue of Shirley being a widow and Keith being the oldest is addressed. Also, funny is the revelation that although Keith comes on rather innocent, he really isn't. Danny: Why do people go through so much trouble when they don't even want to have babies? Keith: It's hard to explain Danny, you just have to be there. ... Also, funny is the revelation that although Keith comes on rather innocent, he really isn't. I enjoy the Summer Days performance, too. I guess we weren't the only ones, since they used the same one again in another episode. I also like David's version of it on "Dreams Are Nuthin' More Than Wishes...". It's my favorite DC album. The bit with Freddy being grilled by Keith was pretty funny. Keith: I wanted to surprise them. Shirley: It certainly would've been a surprise! Also, I DID have the Maroon Crushed Velvet Pants & a matching Vest! Sorry I'm a bit late to this discussion. I've only seen about 20 PF episodes and this one is my favorite so far. I loved the scene with Danny and the facts of life and how it ended with Keith painfully uttering "You have to be there." LOL!!!!! Yes, it did strike me as odd that Keith seemed to have the answer to that question. Also, that scene where Chris and Tracy come to him for career advice is priceless. I thought that scene came off brilliantly. Very funny. My kids actually told me they wanted to be black in the grocery store when they were about 6. That was when Michael Jordan was all the rage. I would bet it's pretty common actually. Forgot to say I really enjoyed that scene with Keith grilling Freddy too. Freddy was great!!!! And yes, Summer Days is so great at the end, the way Keith goes around to each member.